Venice is a mandatory stop on any well known cruiser and, despite not being a too big city, has one of the most outstanding cruise ports on the Adriatic. The Ducal Palace, St. Mark's Square or the Basilica of Santa Maria della Salute are some of the monuments that welcome travelers who come to the Italian city by cruise and disembark at the Passenger Terminal of Venice. The Maritime Station of Venice or VTP (Passenger Terminal of Venice) is located between the island of Tronchetto and the area of ​​San Basilio, just west of the city. It is very well connected to the neuralgic center of Venice, which can be accessed by water taxis or through a boat service. The Passenger Terminal of Venice has an annual traffic of more than 1,000,000 people and is the gateway for tourists who come to Venice through large luxury cruises. Passenger Terminal of Venice, Aero Bench. Terminals 103, 107 and 108 are the main cruise terminals of the Maritime Station of Venice. Vincenzo di Donato was his interior architect and he trusted SELLEX to equip the waiting areas of the three terminals. The AERO Bench was chosen as the waiting seat for the passenger terminal, a bench that already has a presence in more than thirty countries around the world. 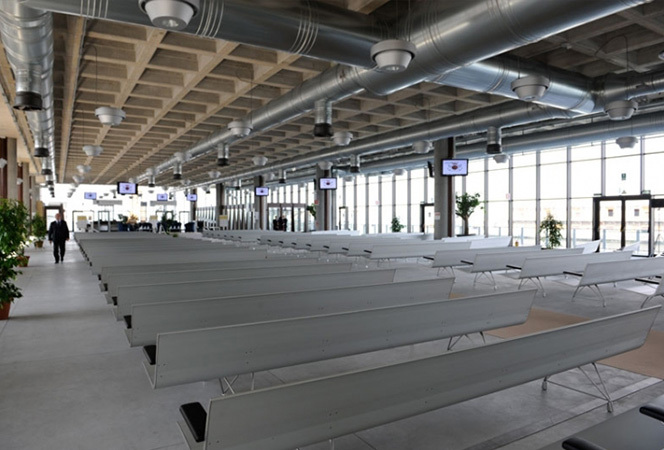 The version of AERO that you can find in the Maritime Station of Venice is the aluminum with polyurethane arms one, although in the VIP areas of the terminals, AERO benches were installed with leather pads. The equipment is completed with special tables made to match the AERO aluminum bench, following one of our lines of work: the manufacture of custom furniture tailored to our customers.